During Breast Cancer Awareness Month we reach out to friends who have been diagnosed with breast cancer, celebrate remissions and comfort those who have lost loved ones. But we should also consider why the U.S. has one of the world’s highest rates of breast cancer, and what we can do to prevent more women from developing the disease. Women are told to reduce their risk of developing breast cancer by avoiding tobacco and some hormone-based medicines, eating a healthy diet, exercising and limiting alcohol consumption. Still, thousands of women who adhere to these recommendations are diagnosed with breast cancer each year. Why? Once disputed as a contributor to breast cancer, environmental pollutants are now known to play a significant role. Chemicals in our food, water and homes can alter DNA and gene expression to change the way breast cells develop, making tissues susceptible to cancer. Of particular concern are exposures during pregnancy and childhood. One carefully designed study found that American women with high exposures to DDT before puberty had a five-fold increase in breast cancer risk compared to women with lesser childhood exposures. This month, the Silent Spring Institute published a review of 158 observational studies of pollutants conducted over the past decade. 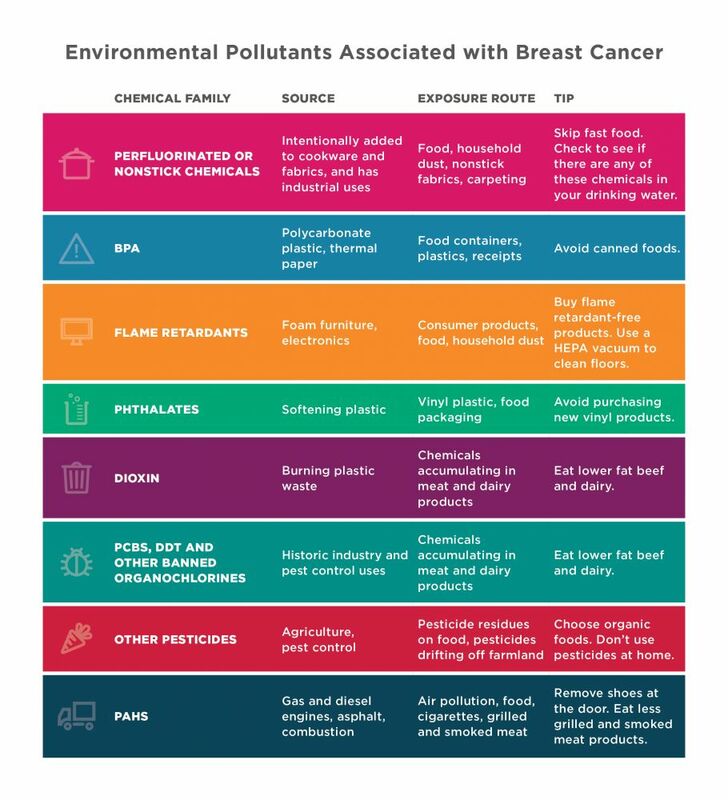 It identified 16 classes of environmental pollutants and additives in consumer products associated with breast cancer in human studies. Julia Brody, one of the review’s co-authors, concluded that chemical exposures are increasingly recognized as the most preventable risk factors for breast cancer. Biomonitoring studies show that most of the pollutants identified by the Silent Spring Institute are widely detected in Americans’ bodies. Experts believe that controlling environmental pollutants and cleaning up the food supply could help lower American women’s risk of breast cancer. But in the absence of strong safeguards and pollution prevention, the burden falls on women to protect themselves. To help them, we’ve identified key sources of exposure to environmental contaminants linked to elevated cancer risk. While it is impossible to eliminate these chemicals from your body completely, it is wise to limit your exposure as much as possible. Many other hormone-disrupting chemicals are added to plastics, cosmetics, sunscreens and other products. Researchers don’t know whether avoiding specific consumer products can drastically lower an individual woman’s chance of developing cancer, but minimizing overall exposures to chemical pollutants likely decreases the risk of many chronic diseases. For more tips on chemicals to avoid, check EWG’s Dirty Dozen Endocrine Disruptors. As you adopt these changes to reduce your exposure to suspect chemicals, also eat healthy, stay active, and join EWG and other activists to press for more research into cancer prevention and making the environment cleaner and healthier.